The #1 Italian English Dictionary for Android Phones and Tablets. 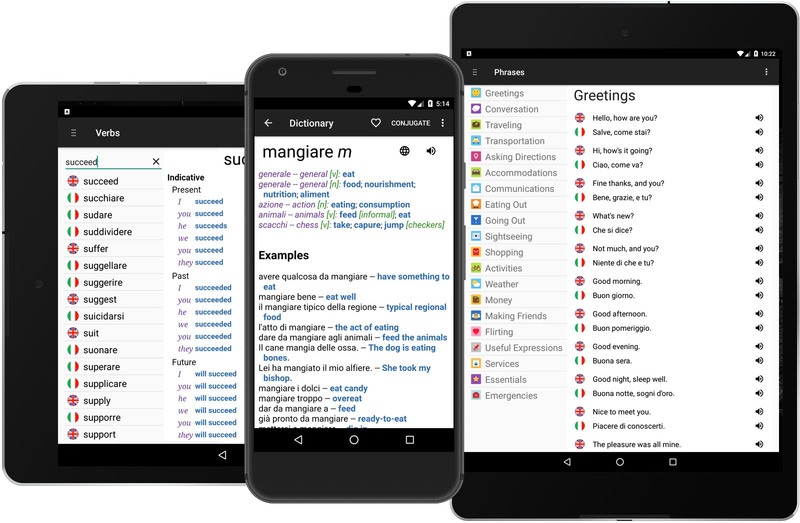 Advanced features and extensive content make VidaLingua the most comprehensive Italian English Dictionary for Android Phones and Tablets. Fast, works offline, shows gender and context information. I've tried so many dictionaries, but this is by far the best android one. " This app works perfectly and has many examples. Totally recommend it. " So brilliant. Love this App, simple and comprehensive. " The best I have found... I'm recommending the paid version which for me is a bargain. " It's a very easy, friendly app to use which elaborates on the words that you are looking for. It gives a lot of examples and it's very easy to understand. I absolutely loveeee it. " Italian English Dictionary with over 720.000 offline entries (premium), over 91.000 for free. Includes translations, usage examples, parts-of-speech and gender of Italian nouns. Compiled and updated by professional linguists. Twenty categories such as Conversation, Asking Directions, Eating Out, Flirting and Making Friends. Search on key word. Hear phrases pronounced in Italian or English. Conjugations of 6.658 Italian & English verbs (premium), 1.537 for free, in all major moods (Indicative, Subjunctive, Conditional) and tenses (Present, Past, Future, Perfect, Pluperfect, Future Perfect). Translate complete sentences from one language to another (requires internet). Hear translations pronounced in Italian and English. Language is living! Only VidaLingua allows you to add words, notes and images to the dictionary. Italian English Dictionary + is an engaging travel companion, enriched by your learning experiences. Download for free from the Google Play and start learning today!